Simon & Schuster, 9781501176203, 304pp. "Inventing Joy is an empowering journey packed with lessons that readers will thrive on." "Light, enjoyable...Mangano discusses familiar business-book themes such as creative thinking and a willingness to speak up for oneself, but what sets her story apart from other entries in the genre is her wholehearted embrace of the messy but rewarding process of including family and friends—even her ex-husband—in her work. Ending with an eclectic collection of inspirational quotes and an invitation to contact her about inventions, Mangano will leave would-be entrepreneurs feeling encouraged, as well as entertained." 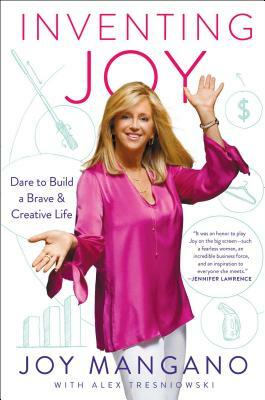 "Roadblocks were the very things that kept Joy Mangano, the inventor of the Miracle Mop and more than $3 billion worth of successful products, moving forward. She details her journey in her relatable new book, Inventing Joy." "Hollywood is known for buying the rights to a book, then making a movie that is either not as good as the book or does not tell the same story. In this instance, however, the order is reversed, with much better results...Inventing Joy is like sitting down and enjoying a coffee with the entrepreneur...Fascinating."